A study abroad program in New Zealand during Winter Session brought together undergraduate learning and Cooperative Extension experience, two major aspects emphasized by the University of Delaware’s College of Agriculture and Natural Resources. 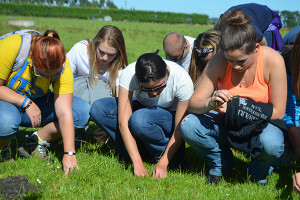 This unique study abroad program blended classroom, experiential and extension education to deliver a unique discovery learning experience focused on New Zealand agriculture. The five-week trip was led by Lesa Griffiths, professor in the Department of Animal and Food Sciences, and Susan Garey, animal science extension agent, who explained that the students divided their time between classroom learning and field experience as they traveled to farms and dairies to learn about the differences in farming and agriculture practices between the United States and New Zealand. Garey said that she liked how the trip tied together the extension and undergraduate aspects of education. “We have the formal lecture in the classroom but getting out to the farm and looking at the blades of grass and seeing how pastures yields are measured and how you determine where to move the cows next in the grazing system, I just think really drives the point home to students.” The students learned so much about New Zealand dairy and agriculture that two who went on the trip were able to present at Middletown High School at the annual meeting of the Delaware Holstein Association. The students talked about New Zealand agriculture and more specifically, about the dairy industry, such as typical farm size, how milk is marketed and the main products of the industry. Pasture growth Griffiths explained that the UD students learned a lot about pasture growth on their trip, both inside and outside of the classroom. Because the animals consume the grass available to them from pasture on farms in New Zealand, rather than being fed grain or harvested feeds, as is the case in America, understanding pasture growth is vital for that nation’s farmers. The students stayed at Lincoln University in New Zealand, where they visited a 600-cow demonstration farm built to serve as a model for dairy farmers in the region. Griffiths said the demonstration farm “serves more of an extension role — a place to try new pasture species, closely monitor pasture growth and animal performance, determine environmental impacts and share information with dairy farmers.” Students learned from the farm manager about the concept of a pasture feed wedge, a graph of the current pasture status by ranking each paddock’s average pasture cover, she said. “While the graph made it easy to see how much grass is out there for cows to consume, it was not so easy for students to visualize how the farmer gets his/her data on pasture grass production,” said Griffiths. To help farmers and students understand this, the farm staff would walk the pastures every Tuesday. “We showed up at the dairy and walked and measured weekly growth in each of the 21 paddocks. We stopped along the way and learned to evaluate the grass itself,” said Griffiths. Jenna Wilson, a sophomore majoring in pre-veterinary medicine and animal biosciences, said it was clear that the farmers cared dearly about their grass. “They really want the grass to produce well so that the animals produce well. They talked about when they cut it and when they grow it, where they grow it, and how they divide up the pasture.” Garey added that the need for animals to feed themselves through pasture originated out of necessity because the farmers “don’t have the soil types to grow as much grain as we do here.” Dairy differences One of the biggest differences the group learned about was in the management of dairy farms. “New Zealand exports a lot of milk but one of the big cultural differences is New Zealanders are not large consumers of fluid milk,” said Garey, who explained that a majority of that nation’s dairy production is exported in milk powders that are headed to Asia, as well as in baby formula and in products such as cheese and butter. Garey added that while dairies in America tend to milk their cows 305 out of 365 days of the year, the New Zealand dairies milk their cows around 223 days a year. Wilson explained that a big difference between the two countries is that New Zealand farms tend to be more hands off and have fewer buildings for the animals. “They don’t really interact as much with the animals as we do — except for dairying, obviously, because they have to bring them in twice a day. But a lot of the time, they just put the animals out in the pasture and leave them there until they need to shear them or breed them,” said Wilson. Deer farms Another difference between the two nations is that in New Zealand there are deer farms. “At the deer farm that we went to, the farmer was raising them for the velvet. Antlers in the velveting stage get shipped to Asia for medicinal purposes. When they get older they use the deer for meat,” said Wilson, who added that these farms are easy to spot because they have very high fences to prevent the animals from jumping out. Garey added that the deer on those farms are red deer, which differ from the white tailed deer found in Delaware. Garey said the deer farms are what she calls a sign of “Kiwi ingenuity,” explaining that because deer — along with other animals — were brought to New Zealand from England, they had no known natural predators and their population exploded. Some New Zealanders decided to trap the animals and farm them in order to harvest either their velvet or their meat, usually focusing on one or the other. “They do well in the harsher country so it’s a way to use the variability of land,” said Garey. “The south island of New Zealand is very diverse from the flat plains to high country and hill country. The high country environment is much harsher and that would not be good land, necessarily, for milking dairy cattle, but deer can do well in those environments.” Because of the variability of the land, the farms also have multiple uses, sometimes housing sheep, deer and cattle, instead of focusing on one species. Article by Adam Thomas This article can also be viewed on UDaily.